Can you see why I named it that? Fill the cocktail shaker with ice. Add the pear puree, vodka, lemon juice, lavender honey and ginger. Shake until chilled, pour into the chilled glass, top off with the sparkling cherry juice. 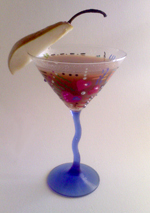 This is an absolutely wonderful way to use a ripe pear. I added a pinch of fresh ginger for a little spicy kick but feel free to use a pinch of powdered ginger if you want, just be very judicious and don't use too much or you run the danger of the ginger overpowering the delicate pear. 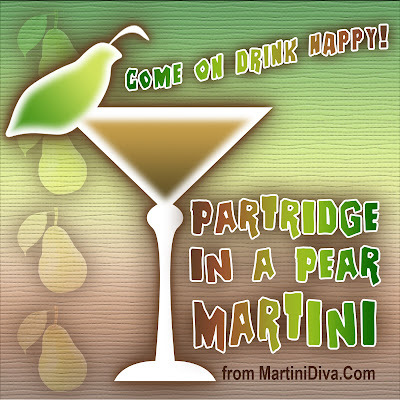 So, Come On, DRINK Happy at happy hour with my Partridge in a Pear Martini.